Is it boring going on about the credit crunch? In the restaurant industry, it is hard not to. Everyone is obsessed. Important questions are asked, over and over again. What is going to happen? How has Tom Aikens got the nerve? Can Le Bouchon Breton possibly survive deflation? And when is my pudding arriving? Of course, what really obsesses chefs at the moment is the most basic thing; how to keep their customers, all of whom are feeling the pinch themselves, coming back for more. The tried and tested way is to offer cheap lunch deals and bargain meals. Yet will that be enough in the face of dwindling pensions and a customer base becoming used to drinking tinned soup for supper in a house with the heating turned off? In the coming months, much depends on intent and integrity. Certainly, some London restaurants have done terrific lunch deals for years. Le Gavroche, Racine, Café Anglais and Galvin all spring to mind as places of excellence serving lunch set menus that offer value and flair in convivial surroundings. Not everyone is always so kind. Branded on my mind, like a bad memory carved in black, was a cheap lunch deal at the Bl****** restaurant a few years ago. Suckers on the cheap deal were immediately made to feel like lepers. Herded into the grottiest section of the restaurant, we all huddled together like forgotten starlings on the nest. Dishes of haricot beans crusted over with exhaustion and bits of ham bones were hurled in our direction by laughing waiters. Pudding was a bit of Arctic Roll. Everyone left hungry and dispirited. However, credit crunch 2008 seems to have galvanised chefs into giving good quality and value at the bargain ends of the menu. 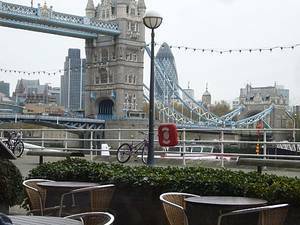 At Le Pont de la Tour, for example, there is a three course lunch including a glass of champagne for £25. What is remarkable about this is that in 2004 they had a three course lunch for £29.50. So we are moving in the right direction, even if service and extra side dishes of French beans or pommes sautés (both at £3.50) are not included. When S arrives at Le Pont to check it out, they show him to a beautiful table by the window, with views of London Bridge, the Gherkin and all of the capital city in its crystalline winter glory. ‘No, I’m on the cheap deal,’ he croaks, lest they have mistaken him for a rich businessman who is about to gorge on caviar and giant balloons of cognac for half the day. Yes, yes, of course, but please, sit, sit, they say. Then they bring a brimming flute of nicely chilled champagne and hand over a menu. There are three choices for each course and although you can see the prudent housekeeping and the lack of luxe, it is still a good deal. Starters include pumpkin soup, crayfish cake or chicken and leek terrine; mains feature a beef and Guinness pie, chicken breast poche-grille or pan fried sea bass. So, S has the crayfish; a puck of crispy batter filled with what he describes as ‘run of the mill, pretty tasteless farmed crayfish’ and potato. You don’t even like crayfish much, I say, so why did you order it? Well, he says, it is not bad. The fennel salad it comes with is delicious and a spritz of truffle dressing adds a rootsy element, so all in all he is pleased. Main course is a triumph. 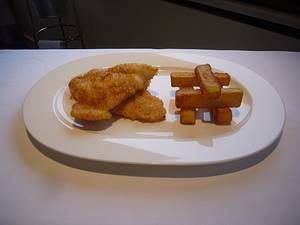 A generous portion of fillets of plaice is cooked in a soft, but not soggy, egg batter. The fish is firm. Pommes pont neuf – chunky chips to toi et moi – are from good quality potatoes. The whole dish is beautifully served, with a muslin-wrapped melon and little ramekins containing their take on mushy peas and tartare sauce. To finish, some poached autumn fruits, served with a whirl of Chantilly flecked with hazelnuts and what S describes as; a ‘bit of cake’. The plate has been dipped in nut crumb which, apparently, is 'soemthing I like to see.' What I like to see is a bargain offer like this; the opportunity to sit on a sunny, cold day in one of the prettiest restaurants in the city with a big plate of value for money. As a starter, he has a vegetable seekh kebab with poppy seed and rose petal. This is, he says, like ‘gun barrels packed with vegetables,’ which gives you some idea of why the food descriptions are usually left to me. Anyway, he gives it both barrels, which are rolled in spices and seeds, served with a fresh mango dip. Main course for my boy; a big plate of fiery Laal maas; the famous Rajasthani curry which is made with chilli, turmeric, onions, yoghurt and garlic. This Cinnamon Club version is made very nicely; the sauce properly reduced, the lamb tender, the spicing hot, but just right. There is also a stir fry of broccoli and cauliflower, and a dish of yoghurt sauce, which is all a bit of a bargain, all things considered. Even the rice is nicely cooked; the grains separated and spiced with cumin. S even manages to pack in a pud; a ‘Shrikhand’ brulee with a walnut and date roll on the side. Other choices include starters of tilapia with chilli and vinegar or sandalwood-flavoured chicken breast. The other main course is an aromatically spiced mackerel. The point about all this is, many restaurants have clearly had a big think about how to negotiate these difficult times. The smart ones realise that the best way forward is to give customers more, not less. These two meals are both terrific, in terms of the quality of the food and the generous manner and style in which they are served. Fish and chips with champagne by Tower Bridge, or a terrific curry in the shadow of Westminster? 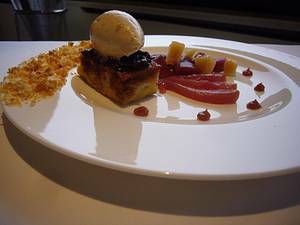 Lots of excellent deals in these lovely restaurants are really worth investigating. Even China Tang, with its crippling wine list and mortgage-worthy roast duck – the kind of place that brings on a financial crisis all of its own – are offering a budget-conscious set lunch. We must be in trouble! La Pont de la Tour, The Butlers Wharf Building, 32d Shad Thames, London SE1 2YE. Tel: 020 7403 8403. Smith Street, London SW1P 3BU. Tel: 020 7222 2555. China Tang, The Dorchester, Park Lane, London W1K 1QA . Tel: 020 7629 8888. La Pont de la Tour, The Butlers Wharf Building, 32d Shad Thames, London SE1 2YE. Tel: 020 7403 8403. The Cinnamon Club, The Old Westminster Library, 32 Great Smith Street, London SW1P 3BU. Tel: 020 7222 2555. China Tang, The Dorchester, Park Lane, London W1K 1QA. Tel: 020 7629 8888.